Most of the rose oil - Rosa damascena produced in the world comes from the Valley of the Roses in Bulgaria. 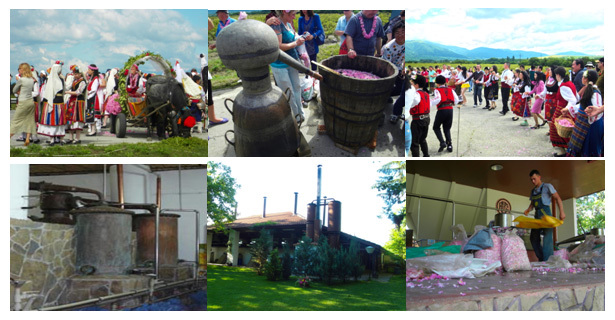 On this unique trip you will enjoy the excitements of the Rose Festival, take part in the rose harvest, see the rose distillation process and more importantly buy the freshest rose otto oils and related products at manufacturer price. The superb qualities of Bulgaria’s variety of grapes are also famous to the world. Wine production in Bulgaria goes back to the ancient times and Thracian’s wines are well-known of their delicious tastes. Wine degustation is another highlight of this trip. Beside roses and wines, you will visit the beautiful medieval city of Veliko Tarnovo and Plovdiv as well as the capital city of Sofia; experience an eco-trek walk and the traditional village living. Meet at the Sofia airport at 2.30pm and head onto the village of Kalofer. In the evening, hear a talk on “The History of the Rosa Damascena” and enjoy a welcome dinner with Bulgarian traditional home cooked foods. Stay in Kalofer over the whole trip. Spend the morning at the Rose Festival in the nearby village of Kazanlak, watching locals dressed in colourful traditional costumes performing live music and folk dances, and the Rose Queen Parade. In the afternoon, drive to Tarnichene and visit its active rose distillery, the Enio Bonchev Distillery, where you will learn first-hand about the painstaking process used for harvesting and producing this precious substance, and the use of rose oil in a variety of products from oils to rose jam and rosewater. In the evening, enjoy dinner back at Kalofer. Rise early to join the rose harvest in the rose fields. Afterwards, join local guide for a half day hike along the Biala Reka eco-path, examining local flowers and herbs on the way with a picnic lunch en route. This specialist walk received the Conde Nast Traveller Award for best eco-destination in the world in 2005. Later, visit the men’s monastery and hear a liturgy. In the afternoon visit the Rose Factory with workshops and learn from the factory owner how to prepare face cream and soap. In the evening, join a workshop to prepare rose jam and rose syrup. After breakfast, departure to Plovdiv, an architectural museum reserve with over 150 monuments of culture - houses from the National Revival period. Its magnificent houses are turned into museums, galleries, workshops, restaurants. There are also parlours and studios of painters and wood-carvers. UNESCO awarded Plovdiv a gold medal for architecture in 1979. Bulgaria with the idealistic conditions for wine cultivation, wine production goes back to the ancient times and we will visit Starossel Winery in the afternoon for wine tasting. Drive to Sofia early in the morning for a city tour before your flight back home. During the tour you’ll visit the cathedral and memorial church of “St. Alexander Nevsky” with the crypt – icons gallery, The remains of the Roman city with Rotunda, transformed into church and another impressive buildings - The National Theatre “Ivan Vazov”, Russian church, The Sofia University “St. Kliment Ohridsky”, etc. The trip ends at Sofia airport around 13.30.